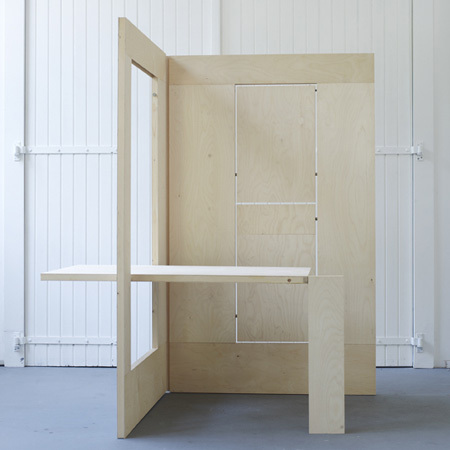 Dutch designers Kapteinbolt have created a collapsible plywood workspace. Called FLKS, the design features a desk and chair that fold out from two hinged sheets. The whole arrangement can be folded flat and leaned against a wall when not in use. We like to introduce FLKS (flex), a flexible workplace. Just open the panels unfold the table and the chair and put the plug in for light. The legs from the table and the chair are provided with special designed joints, pull and turn 90°. The dimensions of the panels are a combination of sizes according to the Modulor of Le Corbusier in combination with the functional human sizes of today. This design is characterized by simplicity, clarity, freedom and space. Freedom in using and in arranging this workplace. The dialogue between the space and furniture, but also the spaciousness of the furniture itself is an important fact. By bringing furniture back to the essence you can create space. The FLKS provides a definition of space. By giving cover to the back and to one of the sides, the FLKS creates a private and comfortable workplace. The closed panels open in a 90° angle. The workplace is easy to move and usable in any space. FLKS is not only a functional piece of furniture, but also a room divider. Several pieces can be arranged into perfect work stations. The pieces do not only interact with the space in which they find themselves, but also with each other. With an extra chair it is even a workplace for two. The various units do not only interact with the space in which they find themselves, but also with each other. One panel at a side and one panel at the back, open or just a frame, provides a safe and homely feeling. This definition provides a safe and private feeling, by giving cover to the back and to one of the sides. This cover can be formed by a closed panel or by just a frame. Kapteinbolt is a design studio for 2d and 3d design founded by Louwrien Kaptein (interior architect) and Menno Bolt (multimedia designer).